Leaving the Twentieth Century — The Old Town Alchemy Co. I've been in the process of working up a small cocktail offering for a function we're hosting at Sygn in a couple of months time. There are some obvious choices for it - the event isn't industry-focused so I won't be going too obscure or bleeding edge with anything - but flicking through various menus and recipe books led me to the Twentieth Century cocktail. Shake all ingredients with ice; fine-strain into a chilled martini/coupe. Garnish with a twist of lemon zest. According to Ted Haigh's Vintage Spirits and Forgotten Cocktails, it was named for a train, the 20th Century Limited, that plied the route between Chicago and New York in the near aftermath of Prohibition. Haigh suggests that earliest written record comes from the Café Royal Bar Book of 1937 and that "we now have a firm idea of exactly what Art Deco tastes like." On a personal level, I found the Twentieth Century profoundly depressing. It's not because it's a bad drink - it certainly isn't - but there's something about the way those four ingredients just sing together that make me wonder if I'm ever going to put together a recipe that comes close. On paper, it's just four ingredients. In the real, it's exceptional, and that's something to aim for. 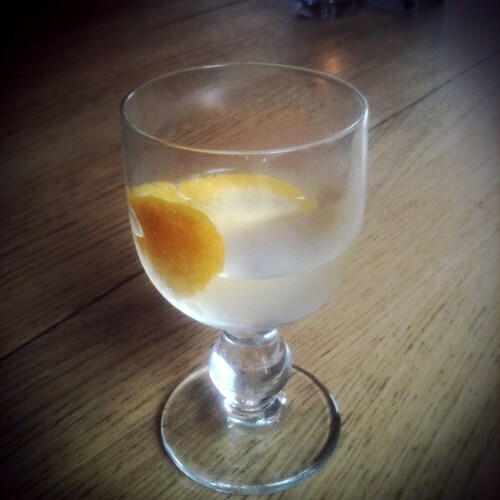 Posted on August 23, 2011 by Jon and filed under Mixology and tagged cocktails Creme De Cacao gin Lillet Blanc Ted Haigh Vintage Spirts and Forgotten Cocktails.